“Don’t Know Much about History:” Michele Bachmann stumbles with the facts again | When I Survey . 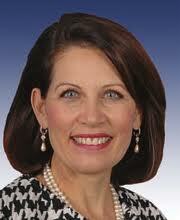 . .
Rep. Michele Bachmann (R.Minn. ), who has been reported to have Presidential ambitions, told prospective voters in Manchester, New Hampshire, “What I love about New Hampshire and what we have in common is our extreme love for liberty. You’re the state where the shot was heard around the world in Lexington and Concord.” Those battles were actually fought here in the Bay State. Many of the founders, including George Washington and (famously) Thomas Jefferson in fact owned slaves, and while she was right that Adams fought tirelessly against slavery he was not a founder. And the Constitution itself, which she considers a sacred document, defines a slave as 3/5 of a person. You would think that a leader of a movement that calls itself the “Tea Party” after the BOSTON Tea Party would know something about our early history. Boston is in Massachusetts. But as Jillian Rayfield wrote in her blog today in The New Republic, “I’m starting to wonder if the Republican policy of recruiting its female political talent heavily from the beauty pageant circuit may not have some downside after all.” I didn’t say that, but it’s something to ruminate on. This entry was posted in Political facts. Bookmark the permalink. >Fun fact:Back in 1932, on April 19th (Patriots Day) the GE-owned station over in Schenectady (WGY) staged an actual "shot heard round the world" by firing a shotgun in the studio, the sound of which was transmitted, station-to-station, in an around-the-world radio hookup — perhaps the first ever, I don't know. (Paging Brad Spear.) Pulling the trigger of an actual Revolutionary War musket was Massachusetts governor Joseph Ely. Berkshire Eagle publisher Kelton B. Miller was present for the occasion, with various GE and station bigwigs, and somebody's dog. No women, by the way. At the Eagle, there's a picture on the wall of the lineup, including "dog who heard the shot heard round the world." This is the sort of thing that has never been detailed on the entire Internet, until now (at least, the dog part is an exclusive), so you heard it here first.